Rich purple hues in the glass with classic Bordeaux notes on the palate. Cassis, lovely oak and dark cherry are dominant on the nose. On the palate it is slightly thinner than expected but its litheness is appreciated. Plums, blackberry reduction, black olives and charcoal dominate the initial palate. Very lithe tannins peak on the mid palate with very slight acidity countering them. The finish is where the astringency kicks in with black tea, black currants and spice box. This wine is drinking very nicely now and will improve over the next 10 years. 92 points and 4 stars for this $55 Grand Cru. Salut…. 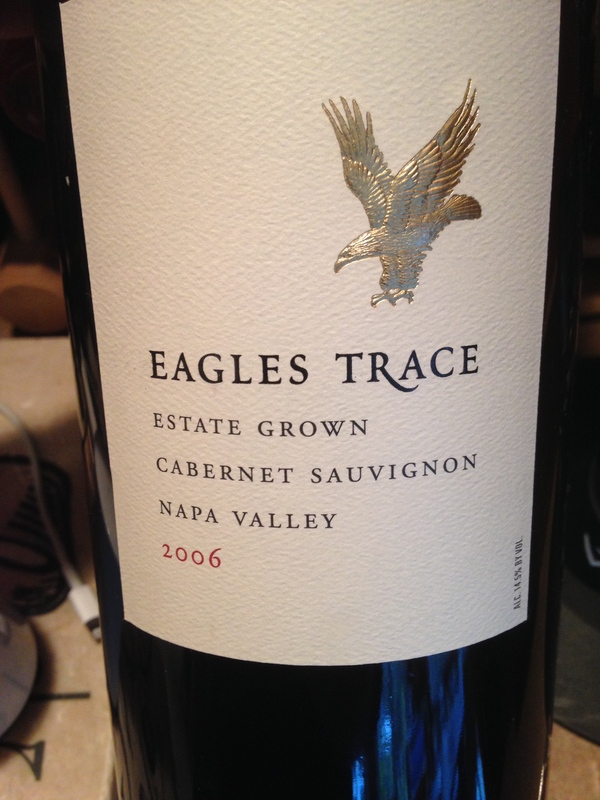 I have previously had the Eagle’s Trace Cabernet, in Magnum. Dark purple with a touch of brick. On the nose it has a bit of funk- hoping it blows off. Black cherry, cola, eucalyptus hit me after a hard swirl. On the palate it shows red fruits- a rich acidity and fine grained tannins. Raspberry, cherries jubilee and an oak influence all hit. The mid palate gets me back to cola. Sassafras appears on the tail end where the tannins start to grip and the mouthfeel turns astringent. Enjoyable if you like a dry finish. 89 points and not a bad choice for Thanksgiving that included a smoked turkey as well as a deep fried one. It did not hold up as well as I had hoped. For $55 it gets 2 stars from me. Salut…. Last night I had an old College friend over for dinner. We ate Brisket, as can be seen in my previous post. While it was still cooking we have heavy hors d’ouerves and I opened up a stunning set of wines. The 2001 vintage from Bordeaux has been quietly sitting in my cellar and I really should get to drinking them, time flies and most wines fade. So, we started out with the amazing 2001 Chateau Cantermerle, which has been drinking well for a decade now. The first tasting note I wrote was in 2011, the wine has only gotten better and more defined. The secondary flavors are in place, the fruit is still present and the tannins are fully melded. A great 91 point wine that I really enjoyed. I purposely did not write notes, I just wanted to enjoy the moment and relish the wines. A quick check online shows this one available for $55, making it a 5 star effort even at 16 years of age! Well done. Salut…. 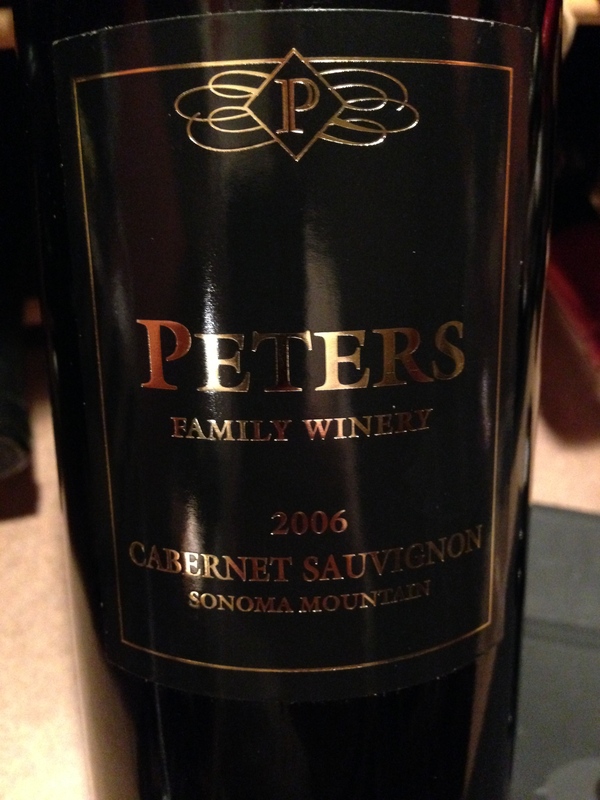 I tasted the 2006 Peters Family Cabernet exactly three years ago and am impressed that it has evolved more and gotten a higher score from me. A nose of black currant preserves, pine needles and tar. On the palate a beautiful intro of plum, black berries and dried mint. The mid palate shows off some great tannins that are persistent yet subdued. The acidity is somewhat muted, overshadowed by the fruit and tannins. The finish is short to medium in length but ends with the tannic dryness. This wine has a great mouthfeel that I really like and the fruit is still vibrant. A mostly Cabernet Sauvignon wine that has 23% Merlot mixed in. Secondary flavors are evident and I’m excited about this wine’s development. Drink till 2022 with pasta, steaks and roasted game. 92 points and 4 stars for this $55 effort. Salut…. I bought a magnum of this wine a while back and had it sitting on my ‘everyday drinker’ shelf for the past two months, waiting to pop it at a moments notice. This past week I had that opportunity. Black cherries and eucalyptus on the nose were telltale signs of this wine’s Napa roots. Kir, plum and blueberry initially hit my palate along with some beautiful ingrained tannins. Blueberry jam on a creamy finish with nice acidity lead to a great mouthfeel and long ending. This is Napa Cab at it’s finest, showing off fresh fruit yet with great structure and complexity. This particular bottle was relatively young, especially since it was in Magnum. I would venture a 2014-2024 drinking window in large format. 92 points and 4 stars from me for this $55 effort. Salut…. I went in to a wine store this past weekend looking for a special bottle for a friend’s 50th party. This was one of the ‘gifts’ we took and managed to drink. It is a special anniversary bottling and my first experience with this winery. I must say I enjoyed the wine, it is very much a Napa style, but very approachable young. It started with blackberry pie and blue berries on the nose. Very smooth tannins and balanced acidity were my first impression of the structure with delicious berries and dark fruits opening the show. On the mid palate is where I got plums and nutmeg with some chocolate and cassis. A strange yet compelling combination. The 14.6% alcohol barely showed itself and the whole package was very balanced and certainly drinkable. The wine is ready now and will go for another 10 years easily. I would guess this wine to be a 91 pointer in my opinion and for the $55 price tag, it’s worthy of 3 stars. We drank it before dinner as an aperitif but it would also pair well with grilled meats and some gratin potatoes. 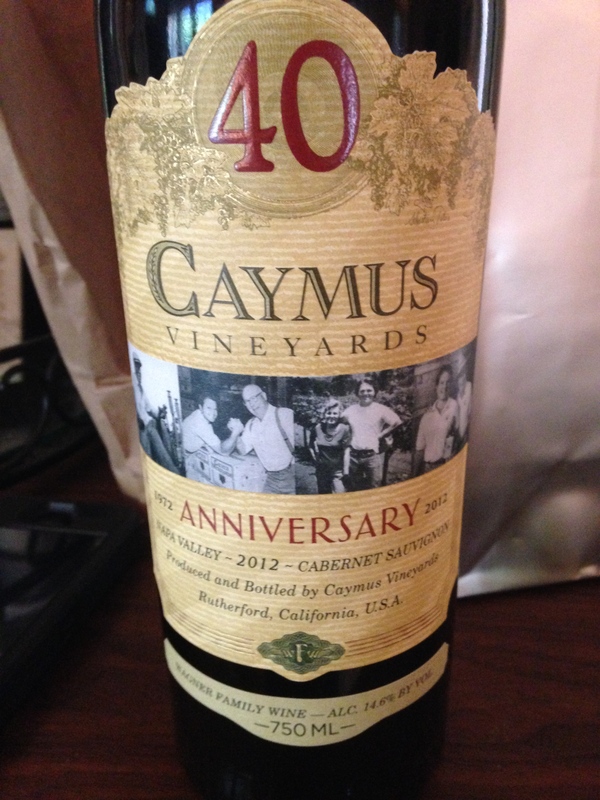 I’m still learning about Napa cabs and this is certainly a nice way to enter the foray. Salut…. One of my favorite things in life is to drink aged Cabs that have taken on secondary flavors and evolved out of adolescence. This is a relatively young Sonoma Mountain wine to have accomplished that task and it really shines for me. It shows off a bright purple hue in the glass and presents itself with black plum and blackberry on the nose. The initial attack comprises blackberry and tobacco with oak and cassis. The mid palate came across with smooth tannins and an earthy component. This wine is super smooth and fruity with a delightful balance of secondary flavors and a delectable dryness. I am totally digging this one and glad to have a few in the cellar. Pricey at $55, i believe it offers some serious value and give it a 91 point rating with 4 stars. We had it with roasted Tenderloin and Yorkshire pudding with horseradish and mushroom gravy. A perfect match. Salut….